Our winter weather can be beautiful, so why not take advantage of it by taking a family hike in Marin? There are so many amazing spots in Marin County that are perfect for a hike or nature walk with kids, whether they're in a baby backpack, a stroller, or walking on their own. The winter landscape in Northern California can be breathtaking, too, with bright green grass and even some wildflowers showing their faces. Here are five of our favorite amazing Marin hikes for families, perfect for winter or any time, really. Remember to wear layered clothing, and it's usually a good idea to let the kids wear their rain boots just in case. 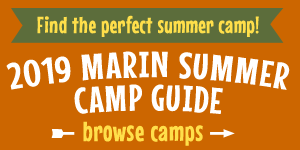 The Point Reyes National Seashore visitor center at Bear Valley is home to a number of fantastic family friendly hikes. The short, paved Earthquake Trail (pictured above) is an ideal introduction to the outdoors for little ones, and the Bear Valley Trail is a good choice when you're up for more of a challenge. There's also the visitor center itself with its natural history exhibits, the Morgan Horse Ranch, and the reconstructed Coast Miwok village Kule Loklo. The wildlife ponds on the Las Gallinas Valley Sanitary District grounds in San Rafael are worth visiting at any time of year, but are especially scenic during the winter. A wide variety of birds flock to this bayside sanctuary, so bring your binoculars. Flat gravel trails are perfect for either a walk or a bike ride. During winter, and especially after a rainstorm, an easy waterfall hike is a great outdoor outing for the whole family. Check out five of our favorites here. Just outside the town of Ross you'll find Phoenix Lake, one of Marin's most popular spots for outdoor recreation. Located on Marin Municipal Water District lands, Phoenix Lake has trails easily managed by families, as well as excellent opportunities for wildlife watching. The Bay Trail opened in the summer of 2014 in Novato's Hamilton neighborhood, and it's one of our favorite Marin spots for short hike or bike ride with the kids. With easy access from several points in Hamilton and stunning views, this is a great place for families to head outdoors for an active outing. It's flat and perfect for a walk with a jogging stroller, and during the winter you can see a variety of birds in the adjacent wetlands.